This installment of the Animal Races-series clocks in at 15 pages, 1 page front cover, 1 page editorial, 2 pages SRD, 1 page back cover, leaving us with 10 pages of content, so let’s take a look! The frog (and newt)-clans presented in this installment as the most civilized of boggards, once again, are presented in the trademark level of detail and believability one expects from Eric Morton’s writing at this point. The supplement does cover both the intriguing psychology with distinct differentiations in aptitude and calling between parents and offspring and the resulting deviations of social structures from the default create a society familiar, yet alien. 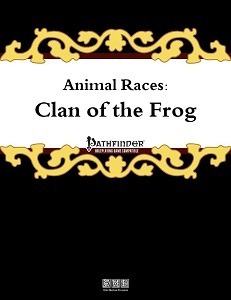 Racial trait-wise, members of the frog-clan are either medium (+2 Dex, -2 Str) or small (+2 Dex, -2 Str), have the boggard subtype, low-light vision, normal speed of 30 ft. or 20 ft. respectively, scent (5 ft., scaling up to 30 ft. at 6th level), natural armor +1 (scaling up to +2 at 10th level) and it gets a sticky tongue that provides a penalty to AC and a movement limitation to those hit with it. The tongue can only be removed by an opposed strength check analogue to the boggard’s ability. A total of 4 Frog Clan variants are provided. Bull Frogs get +2 Str and can select Frog Clan Heritage as a combat feat. Frog Clan members get +2 Int and can choose the Frog Clan Heritage as an alchemist’s discovery, while Toad Clan members get the same modification, but may choose the feat in lieu of a hex instead. Tree Frog Clan members must be small, but gain +2 to Wis and the grippli subtype in addition to the boggard subtype, also gaining the Tree Frog heritage feat -which they may choose as a ranger’s combat style feat. Newt Clan base racial traits are identical with those of the frog clan, except that they gain a primary bite attack at 1d4/1d3 instead of the tongue. The Newt Clan members get +2 to Int and may select Salamander Heritage as a witch’s hex, while Salamander clan members also get +2 to Int and may choose Salamander Heritage as an alchemist’s discovery. Now as to the racial heritage feats, Frog Clan offers hold breath or swamp stride, adding leap and terrifying croak thereafter. Tree Frogs can get camouflage, climb or swamp stride, adding glider, leap and toxic skin to the fray . Salamander’s hold breath, flame resistance and swamp stride complement these options. The pdf also provides a feat that hearkens to the race’s proclivities to strange science – Test Subject, allows you to learn a discovery that modifies physiology or body chemistry. The pdf also provides 6 different alchemist discoveries, one of which nets a natural attack adamantine properties, which is imho a tad bit too soon at level 6. Infusing metal into natural attacks, gills; +4 to Intimidate at the cost of -4 to Disguise and an internal cavity (to store items in) as well as minor DR/piercing + slashing – apart from the adamantine issue being slightly too early in my book, a solid array. The goddess of the new moon and alchemy and the genealogy as well as the interactions with the diverse mythologies of the clans once again provide compelling intersections with established creatures, thus rooting these clans in the respective cosmology and ecology. As always, we are also introduced to heraldic crests, though this time around, they are assigned to the symbols for alchemical substances, with partial negation of attribute-drain/damage providing interesting options. This pdf does go beyond that with a second “deity” (or rather, cult), the Templar Cult, an evil organization devoted to literally worshiping technology – and yes, the pdf also sports 5 new technological items, from circuit threading to ray guns – nice ones! 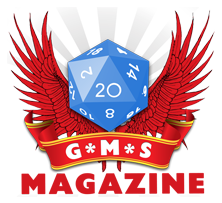 The pdf also provides a new cleric domain with Technology Guide-synergy. Eric Morton’s frog and newt clans are interesting and compelling and over all, there is nothing truly wrong with any of the pieces herein: I really enjoy many of the options provided herein. That beings aid, some of the small balance-screws, while not loose, imho could have used some slight additional finetuning – the adamantine discovery is a tad bit too soon in my book. Still, this constitutes a truly fun addition to the series and ranks among the more unique and culturally distinct files in it. Hence, my final verdict will clock in at 5 stars +seal of approval.